This Vietnamese chocolate pack is a perfect juxtaposition of globalized visual culture and the extraction of semiotic cues of local influence. As ethnographer Arjun Appadurai wrote: “The central problem of today's global interactions is the tension between cultural homogenization and cultural heterogenization… What these arguments fail to consider is that at least as rapidly as forces from various metropolises are brought into new societies they tend to become indigenized in one or another way…” (p. 6; Appadurai, Disjuncture and Difference in Global Cultural Economy, Public Culture). This dialectic drives branding and design codes. The excellent paper by Thurlow and Aiello (National pride, global capital: a social semiotic analysis of transnational visual branding in the airline industry Crispin Thurlow and Georgia Aiello, Journal of Visual Communication, 2007) on aircraft tailfins showed how global kinetic motion vector motifs can be hybridized with local avian mythology to create national airline brands that also successfully conform to an international design idiom. A similar thing is happening here. Chocolate has for a while been becoming much less a sweet confectionary and being seen as a gourmet foodstuff. The cocoa bean usually rendered in faux naïf illustrator (as if straight off a Linaeus etching) style has become a staple image in the brave new world of bean to bar new chocolatiers. The Marou pack cleverly combines this with subtle cultural cues. The brand descriptor and historicist font used for the title is a contrivance of Gallic savoir faire. The title Faiseurs de Chocolat – is ‘made up’ French (it should be fabricants) and the square cartouche reference vaguely fin de siècle France luxury goods. To the uneducated observer (which I still consider myself to be after only a two week stint), the main design influences in Vietnam are Vietnamese re-creations of broadly Chinese design and a re-imagined colonial France. 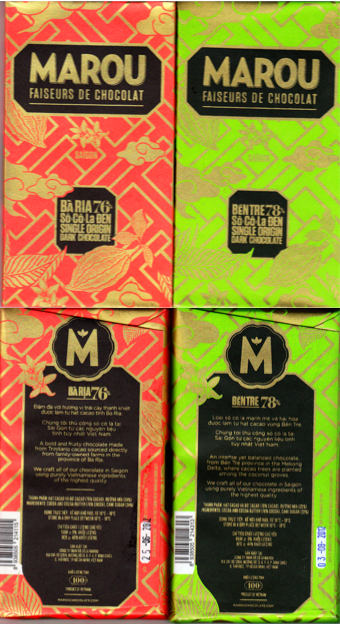 This stunning chocolate packaging from Marou subtly references both of these traditions whilst arguably forging a delightfully charming Vietnamese confection. The building that houses the Museum of Fine Arts in Ho Chi Minh City would probably be a good example of this type of hybrid form. It is a pleasing mix of Chinese and French influences with the splayed eaves and roofing characteristic of pagodas, engraved calligraphic panels, and the cloud and transom patterns in balustrades, but with the shutters, balconies and neo classical influences of French architecture. 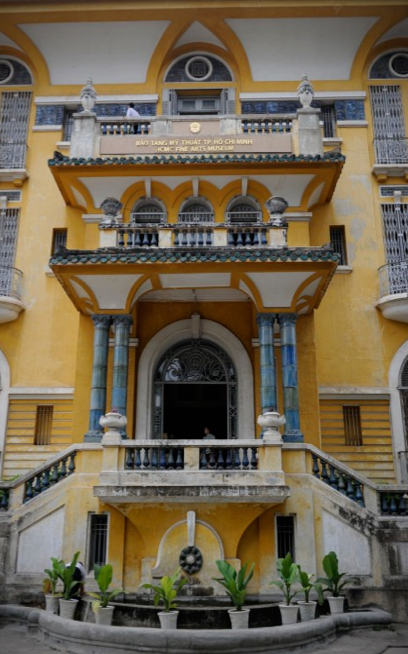 This 1937 building, is an example of forging something distinctively Vietnamese out of semiotic resources available. The colouring of the pack is interesting too. The ochre yellow is ubiquitous in Hanoi and in the South. This stucco seems to be used on all the old French colonial houses. Significant now of faded grandeur, it is arguably used to re-orientalize Vietnamese products for the Viet Kieu, South Vietnamese exiles who crave romanticized views of Vietnam they had to leave behind in painful circumstances in the 1970s and because they do not now recognize their country. When it comes to the luxury goods there is a demand from more discerning old money in both Hanoi and Saigon for nostalgia in art, interior design and packaging. It seems that the two Frenchmen who set up this brand wittingly or unwittingly tap into this vein whilst also auto-orientalizing Vietnam for foreign visitors. I picked this item up in the Sofitel in Ho Chi Minh –; at 131,000 dong, (about $5) it is definitely a chi chi item you wouldn’t find it in a normal supermarket. My cultural anthropologist colleague Christophe Robert believes that this pack would appeal only to the very pinnacle of the social hierarchy in Vietnam, those with both money and symbolic education to be able to appreciate the references. Aside from being beautifully and artfully put together, this pack seems to be a semiotic text that shrewdly pushes the right buttons both with overseas Viet Kieu diaspora, nostalgia craving rich Vietnamese and easily impressed, time pressed foreigners like me looking for swift souvenirs. For almost a century Russian society lived in the sweet dystopia called Soviet communism. No private property, no economic choice, limited contact with the world outside created a feeling that there was one kind of reality, the one Soviet people lived in, and no alternative to it. Even those who refused to believe in Soviet ideas and opposed state ideology faced a total absence of choice in their daily lives. There were ’bread’, ‘milk’ and ‘vodka’ – commodities rather than varieties or brands. Back then it was as if Individual preferences did not exist. Then came the collapse and a new era began. The Russian market burst out with foreign brands and products – and Snickers, along with many other sisters and brothers from the US and Western Europe, conquered the local commodities. This led to a massive and fundamental change in consumers’ mental and visual representation of product reality. With the fall of the Iron Curtain also came a loss of the connection between signs and their hitherto inherent meanings. Previously ‘milk’, for example, had been a universal signifier that mirrored what was perceived to be the true nature of the signified, or at least the mental representation of the thing called ‘milk’ had never been diversified into branded ‘Danone-milk’ or ‘Country House-milk’. It stood as the one and only ‘milk’ – as a category, as a product, as a substance, as a word. With the emerging brands and varieties a tempting world of alternatives opened up to people, now consumers. As we all know, the fruit of temptation can make the gates of Eden close forever. So gradually Russian consumers got used to the market economy and consumption became one of the most common and pleasurable vices. There is, however, something that makes the satisfaction of ownership incomplete – a longing for true meaning. Through past experience the majority of Russian consumers learnt that there could be only one true product, unbranded, the one that actually gave birth to the whole category. The situation where the product on sale coincided with the generic notion of milk by name, along with a general absence of alternatives, coincided with a pervasive perception that somewhere there is a certain space of ‘truth’. In this space any meaning ideally matches the sign – they are a priori linked with each other and there is no way to detach them. No need to say that Roland Barthes’ theory of simulacrum is not taught at schools. Most people think that the idea of a thing is the thing itself and this thing has it’s one and only essence. The one and only name of the thing is treated as the part of its one and only identity. In this case everything is measured in the grades of ‘truth’: the closer a branded product is to the ‘Milk’, the more truthful and the better it is (since ‘Milk’ itself is the absolute best). 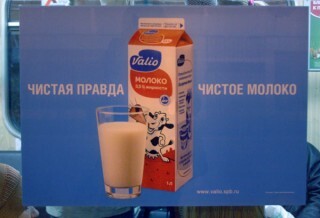 When buying a pack of milk, the Russian consumer always tries to estimate whether this product is true or not. He makes the choice hesitating and continues to hesitate while drinking it. Every new product gives a glimmer of hope that finally this is the one, the true milk, but unfortunately there’s no proof. Again and again consumers search for the true and the criteria of truth vary from person to person. Consumers try to remain ‘true humans’, ‘true men’ and ‘true women’, ‘true friends’, ‘true lovers’ and to choose the ‘true product’. Producers struggle to fit consumers’ image of ‘true’ and construct a system of signs and symbols that could be decoded as the elements of true nature. This situation determines the success of the private labels available in retail. Signs that connote to Soviet times are also perceived very positively. For example, one of Valio’s campaigns was completely based on the idea of truth: big sky blue stickers in metro announce ‘Pure truth. Pure milk’. Claims about real, authentic, essential, pure, natural products from childhood are everywhere. Yet, in consumers’ minds there’s always a seed of doubt: what if in the today’s market reality there’s no truth at all? You are currently browsing the Semionaut blog archives for November, 2012.